Off-price apparel retailer TJX Companies (TJX) reported an increase in profit for the second quarter, when a sharp growth in customer traffic lifted comparable store sales, surpassing analysts’ forecast. The company also revised up its full-year outlook, triggering a stock rally. Reported net income advanced to $740 million or $1.17 per share from $553 million or $0.85 per share last year, exceeding estimates. Adjusted earnings, excluding special items, were $0.99 per share. 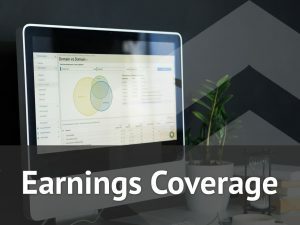 The Framingham, Massachusetts-based company reported net sales of $9.33 billion for the quarter, up 12% compared to last year. Consolidated comparable store sales jumped 6% annually, driven by higher customer traffic across all divisions. Traffic increased for the 16th consecutive quarter. The sales numbers exceeded analysts’ forecast and the management’s own expectations. “Looking forward, the third quarter is off to a very strong start and we have many exciting opportunities we are pursuing in the second half of the year. We are very confident that we will continue to gain market share and grow successfully around the world,” said CEO Ernie Herrman. During the second quarter, the company returned about $844 million to shareholders through share buyback and dividends. 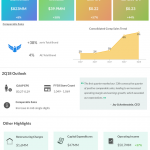 Taking a cue from the strong performance in the most recent quarter, the management revised up its full-year earnings guidance to the range of $4.83 per share to $4.88 per share, representing a 20-21% year-over-year increase. Adjusted earnings per share are currently forecast to increase 6-8% to the range of $4.10 to $4.14. 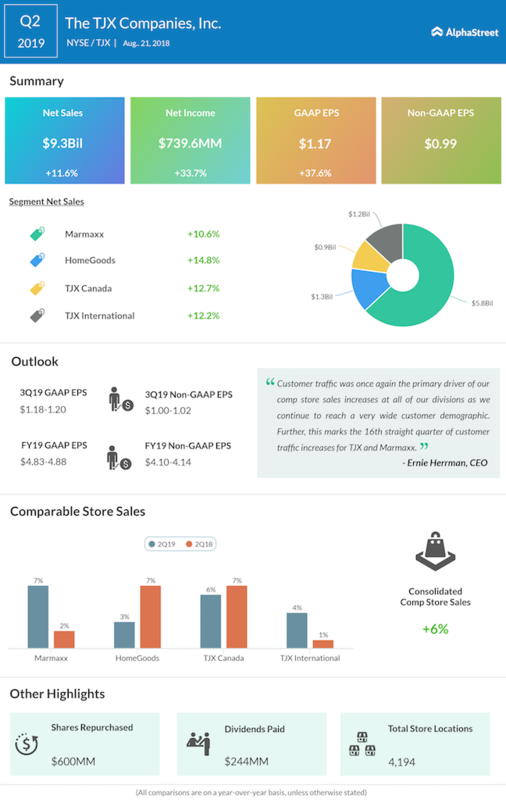 For the third quarter, TJX expects earnings to be between $1.18 per share and $1.20 per share, and adjusted earnings in the range of $1.00 per share to $1.02 per share. Shares of the company gained about 42% in the past twelve months, and the uptrend is continuing. The stock ended the last trading session higher and gained more than 4% after the earnings report.